Having last week walked the up and down Victoria Street not finding a pub willing to serve us a meal, this week was a pleasant return to form. 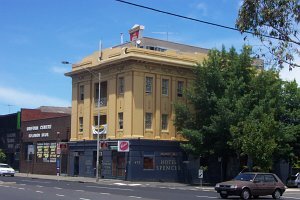 The Spencer barely rates as North Melbourne, but couldn't be missed given what I knew about the quality of its meals, and the enticement of its Monday and Tuesday specials -- standard pub fare for $11. 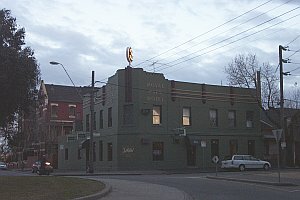 The Spencer seems to attract an older crowd of drinkers, businessmen and a few families in the spacious front bar; girls on a night out in the restaurant area at the back. The decor is polite and classy if conventional: solid colours, lots of wood in the bar and floor. The service above what you'd expect normally. Given the market they are aiming at, it shouldn't be a surprise that the extensive wine-list and menu is good as well. The standard pub meals are outstanding without quite heading into gastro-pub territory. I had the pie, with mash and vegies; the size was good without goign overboard, the pastry was obscenely well puffed, the insides tasty with good solid chunks, although it would be better if the gravy was a bit thicker. Others can rate the parmas and fish but they looked pretty good from adjacent seats. The short: For a good to very good meal. Nothing quite beats stumbling on a good CD. Fractions managed to find me on a good day, when I could be conned by some half-decent cover-art, the fact that I'd written their previous album -- the soundtrack to Somersault -- down on a list of CDs to buy, and vague rumours that they were good. Fortunately, they didn't disappoint. Somewhat reminiscent of Sigur Ros or Faultline, most songs have either no vocals, or a incomprehensible melodic singing, but are remarkably diverse in style. Jets, and Out of Range could pass for radio singles; Traffic male vocals and lack of drums are a different again; while others, notably 451 are closer to techno. Yet it is coherent and solid throughout, and definitely worth looking into. Escape Pod - A fascinating song. No vocals, just working through a few basic themes without ever getting tired. Out of Range - The most likely standalone song, as it hints at choruses and things the others ignore, with a funky bass riff. Traffic - A change to strings, guitars and a typical song structure showing they are pretty good at that too. Shining Path - More instrument changes, this time to heavier guitars to play the same complex melodies. Very cool. "In the town where I live, a once-placid Washington suburb, the mayor has just sent out a letter asking the natives to stop throwing eggs at one another's homes." The trend in the States is to protect your neighbourhood through a homeowners association. Some 50 million people live in areas governed by quasi-governmental organisations regulating everything from the colour of paint to where you can hang your washing (if at all). In Australia we have no such organisations, but the same issues arise; governed instead by ineffective, ill-defined 'neighbourhood character' and 'heritage' designations. Despite the difference, it is almost certain that people conceive of the planning system as being similar to a homeowner association at local government level: that is, it is there to protect their streetscapes from undesirable demolition and housing. This is an issue when you consider the broader aims of planning the residents tend to disagree with: finding a place to build houses, businesses and industry that has minimal impact on amenity at a reasonable cost. Home owner associations offer an interesting comparison with our own system. They represent a stronger (collective) property right that would almost certainly put an end to higher density development in most of Melbourne, forcing the people who would have lived there further out. On the other hand, their sense of certainty and community control is less arbitrary than our planning laws and advantageous from a political and legal perspective (and those associated costs). The hard part is finding a balance between the two. Is it really possible housing developers don't understand the first thing about the housing market? Does the IPA have so little self-respect that it is willing to succumb to pitiful conspiracy theories to justify opposing a Labor policy? Given the IPA is a body supposedly in favour of 'user-pays' and supposedly quite knowledgable about economics, surely charging for the limited as well as undesirable parking in public spaces, thereby discouraging a non recreational use of the land, and providing a revenue stream to maintain and improve the facilities would be a positive thing. Instead Alan Moran ties himself in knots trying to explain why its a political decision to help their union mates by attacking car drivers. It is bad enough when politicians engage in this sort of unsophisticated fear-mongering; we don't need think tanks to join in. "The Productivity Commission report finds that fluctuations in prices and affordability are inherent features of housing markets and that there is limited scope for governments to improve affordability for first (and other) home buyers in the short term." The reality is that most home-buyers mortage themselves to the hilt and prices reflect what they are able to lend and repay. In the short term, these measures will affect developers' profits and nothing else. Over the longer term, both will affect affordability on the margins: the levy by making more affordable land making smaller less profitable; the change in boundaries by increasing development opportunities and the supply of land. But neither is a good, nor a bad, idea on afforadbilty grounds. They are good or bad ideas because of the other (substantially larger) cost of public infrastructure in new developments. And presumably, because if you are going to create a plan for urban development, it is worthwhile pursuing it. The rubbish bin had a nice tone, a deeply satisfying sound that resonated across the small intersection while it rattled on its hinges. It had presented itself at the perfect moment. Three of Antwerp's twisting narrow streets converged onto a small raised roundabout; barely big enough to fit a park bench, the city authorities had instead left a single, round rubbish bin, of traditional height, width and colour in the middle, and left it at that. A single street light sat above it. Designed primarily to stop cars accidientally using it as a speed-hump, it served to illuminate it like a stage-prop from one of those univeristy productions where everything had to be scavenged from the performers' lounge rooms. I arrived at it despondent, but the emotional slide had taken longer than the walk from a little Turkish Cafe to the bin. I hadn't really followed football (soccer) until the early 1990s, and so the first time I saw Australia fall at the final hurdle of World Cup qualification was not particularly crushing. That year we played Argentina, and noone seemed to think the talented but inexperienced team would stand a chance against Maradona by himself, let alone his illustrious team-mates. We didn't, but years later an Argentinian told me how big a fright we gave them. The next time round was completely different: star-players, star manager, and a star stadium with a big crowd. Half the country was introduced to the tragi-comedy that is Australian football that night. Football games are decided by little things, so it is always possible to lose even if you don't deserve to. But many. many little things went against Australia that night in Melbourne. If Argentina was fate, Iran was farce. Ultimately though, the result was the same. Uruguay was different again; more professional in approach; more realistic in what was expected. But I wasn't in Australia to see it. During the first game I was in Milan. I knew what television station it was on; I knew what time it was on; but finding a cafe/pub/something was more difficult than you'd think. Friendly Italians wished me luck but couldn't help me. After an hour or so I gave up and went about town instead. I had managed to miss the only final-hurdle qualifying victory Australia has achieved since we beat Hong Kong in October 1977, but at least we'd won. Two days later, the Australian hostellers in Den Haag told me all about it, having watched it as a large and rowdy group. For the away leg I found myself in Antwerp, where I was crashing on my Latvian friend G's floor. With assignments for university due, and my promise to help later, he left me in the Turkish cafe to the bemusement of the regular customers. They helpfully found me the game on television just as it started, so I settled in, sipped a drink, and watched. It wasn't until Kewell missed on the volley in the second half that one of them asked if it was "no good?". "No", I responded, trying not to tear my eyes away from the little box above the bar, "no good, we need a goal". When G returned with five minutes to go we still needed just one goal. We went close, as usual, but as time ticked out we sudenly needed more than that. G swore at the same time I did. It was over for another four years. On the way back to G's place we came across the rubbish bin. It seemed to have been placed there specially to be kicked, as if someone knew I'd be passing, and knew I'd need an object for that very purpose. I wanted to do so the second I saw it, thirty metres away. Only decorum prevented me from running at it. As I got nearer another thought intruded. I paused, briefly, to check that no stern European authority figures were there to complain. Then, satisfied, and with two steps, I booted it as cleanly and as hard as any ball had been in the match. "No, no I don't". But I did, at least a little. "And whereas it is expedient that the District of Port Phillip, now part of the colony of New South Wales, should be erected into a separate colony, and that further Provision should be made for the Government of Her Majesty's Australian Colonies : Be it enacted, therefore, by the Queen's most Excellent Majesty, by and with the Advice and Consent of the Lords Spiritual and Temporal, and Commons, in this present Parliament assembled, and by the Authority of the same, That after such Provisions as herein-after mentioned shall have been made by the Governor and Council of New South Wales, and upon issuing of the Writs for the first Election in pursuance thereof, as herein-after mentioned, the Territories now comprised within the said District of Port Phillip, including the Town of Melbourne, and bounded by the North and North-east by a straight Line drawn from Cape How to the nearest Source of the River Murray, and thence by the Course of that River to the Eastern Boundary of the Colony of South Australia, shall be separated from the Colony of New South Wales, and shall cease to return Members to the Legislative Council of such Colony, and shall be erected into and thenceforth form a separate Colony, to be known and designated as the Colony of Victoria." Screw the dismissal of incompetent Prime Ministers. That is worth Celebrating. Melbourne Cup Day beign a decidedly bad day to try and get a meal, it was a trepidatious second -- or is this the third -- attempt at the Royal Park. The first was aborted because it used to be closed on a Tuesday. Under new management now, and open, last week we were greeted with a closed kitchen and Eye of the Tiger, neither of which are positive signs. However, they promised they'd have the kitchen open, and I promised we'd be back. This time it was completely different. The music had been replaced by the big screen tv, the bartender by the publican's family, as he leant across the bar. The rest of the bar was unchanged, poll table and assorted games machines in the main room, a tight front bar, and a courtyard out the back. It's a sporting kind of place; traditional, but in a typically modern pub manner. They are still finding their way a little I think, but it was a friendly welcome. The meals are of a standard price, but I think there are Monday specials. I went for the parma, as one does, which was a little different. The chips were closer to the sort you expect in a fish and chip shop, thick and full of oil. The parma was solid, but hardly seemed to have any sauce, making it more akin to a schnitzel with cheese. It was nice though, and the salad wasn't bad, which means, for once, I cleaned my plate. The short: Not sure. Perhaps you should see for yourself.